U.S. Rep. Pingree calls it a ‘do-nothing’ Congress, but she and others note some pluses for Maine. WASHINGTON — The congressional year that ended with a sputter on Friday will likely be remembered – if it is remembered – for the slew of ominous two-word phrases that it produced. And now that it’s all done, historians and commentators have already added another two-headed descriptor to the first session of the 113th Congress: least productive. With only about 60 bills signed into law, this was the least-productive first session in more than a generation. But rather than judge this Congress on the number of bills passed (because some people will argue that the fewer new laws passed by politicians, the better), I asked members of Maine’s delegation to gauge the session on whether it accomplished things they viewed as positive for the country. The question may have changed, but the answers really didn’t. “Quite frankly, there have been very few positive pieces of legislation that have gone through,” said Democratic U.S. Rep. Mike Michaud, who represents the 2nd District. “I think it’s clearly been established that this is the most do-nothing of the do-nothing Congresses,” said Democratic U.S. Rep. Chellie Pingree of the 1st District. The fact that lawmakers in both parties tout the passage of a two-year budget – which Pingree voted against – “just shows we can barely function,” she added. 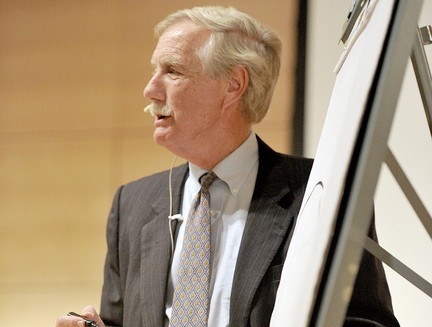 U.S. Sen. Angus King, a former two-term governor wrapping up his first year in Washington, wasn’t feeling much love on Friday as the Senate finished up its work for the year. All of that said, Maine’s delegation members each gave several positive developments that emerged from the first year of the 113th Congress. For King, the 16-day government shutdown in October was the clear low point but ironically also yielded one of the brighter spots of the session: the bipartisan group of senators (led by U.S. Sen. Susan Collins, R-Maine) who worked out a proposal to break the deadlock. While the final version looked different, the proposal put together by the group got negotiations rolling and served as a framework for the deal. King also said the importance of the first budget since 2009 shouldn’t be understated because it provides some financial certainty and likely avoids another shutdown in mid-January. Collins’ office did not make her available for an interview on Friday but said the Republican listed the bipartisan group – dubbed the Common Sense Caucus – and the budget deal as positive developments. The group plans to continue to meet next year as well. Pingree said she was pleased to see progress on addressing the issue of sexual assaults in the military. A defense spending authorization bill that passed Congress this month did not contain as many reforms as Pingree and many others involved in the issue wanted. But she said the level of awareness about the issue within Congress, at the White House and, most important, at the Pentagon is much higher. “That has been a real turn-around,” she said. Pingree is married to S. Donald Sussman, majority owner of Maine Today Media, which publishes the Portland Press Herald/Maine Sunday Telegram, the Kennebec Journal and the Morning Sentinel. Michaud, who is running for governor next year, said progress was made on addressing some of the serious issues facing veterans, including exerting pressure on the Department of Veterans Affairs to address the disability claims backlog. Some important measures are still pending, however. “On the veterans side, we have been able to get a lot of bills passed and signed, but there are still a lot that we are waiting for the Senate to take action on,” said Michaud, the top-ranking Democrat on the House Veterans’ Affairs Committee. Two of the last votes of the year cast by lawmakers in each chamber were to approve a $630 billion defense spending bill that contains some notable items for Maine. • Authorization for an additional $100 million for a DDG-51 Navy destroyer to be built at Bath Iron Works. The money closes about one-third of a shortfall for the ship, one of five to be built by BIW under a multi-year contract. The remaining money will have to be included in upcoming defense appropriations bills. Both Collins and Pingree serve on appropriations committees. • $6 billion to continue purchases of the F-35 fighter jet. The Pratt & Whitney facility in North Berwick manufactures parts of the engine for the F-35. • $23.5 million for construction or modernization projects at Maine military bases, including $11.5 million to speed up consolidation and improvements of the structural shop at Portsmouth Naval Shipyard in Kittery. • $503 million for research and development of a new CH-53K marine helicopter, some of which will likely go to Hunting Dearborn in Fryeburg, which manufactures the rotor shaft. • Resolution of a long-standing legal dispute between the Navy, General Dynamics (owner of BIW) and the Boeing Corp. that will result in BIW receiving essentially $200 million in hardware for the third and final DDG-1000 destroyer to be built at the shipyard. The money resulted from a settlement of litigation over the cancellation of the A-12, a stealth attack aircraft that never made it into production. Both Collins and King played roles in shaping aspects of the defense authorization bill through their respective positions on the Senate Appropriations Defense Subcommittee and the Senate Armed Services Committee. Defense Secretary Chuck Hagel and President Obama’s top trade negotiator received new sneakers this week laced with an overt political message. The sneakers were made by New Balance, the Massachusetts-based company that employs about 900 people at three facilities in Maine. And the message: These shoes are made by Americans with U.S.-sourced components. Staff with Michaud’s office delivered the New Balance sneakers to the offices of Hagel and U.S. Trade Representative Michael Froman on Friday. Michaud and members of the Maine and Massachusetts delegations – as well as others – have been pressuring the Pentagon to require military branches to comply with the Berry Amendment when sourcing athletic footwear for new recruits entering basic training. Passed in 1941, the Berry Amendment requires the Defense Department to purchase food, clothing and some other items from domestic manufacturers. That’s why all parts of a military uniform are U.S.-made with American components, with few exceptions. But the military branches give new recruits vouchers with which to purchase athletic footwear of their choice rather than issue them standard equipment. New Balance says it has a line of sneakers that meet the letter of the law. The new shoes delivered Friday were meant to counter suggestions to the contrary. “I wanted to take this opportunity to set the record straight with both of you: Berry-compliant footwear exists,” Michaud wrote in a letter that accompanied the new kicks. “I have enclosed a pair of Berry-compliant footwear for each of you so you can see them for yourselves. These shoes are made by American workers in Boston, Massachusetts, and Norridgewock, Maine, with components from a supply chain that stretches into 11 other states.